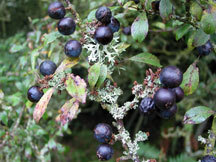 The berries or ‘sloes’ can be picked from the end of September onwards. If you pick them too early, you risk the seeds being immature. Collect them directly from the tree by gripping the branch below and pulling. In this way, no damage is caused to the parts of the tree that will continue to grow. It might be time consuming to collect a large number. 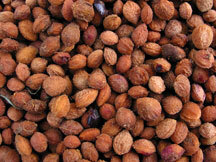 Berries can be stored in buckets or bread baskets for a week or two provided they are kept in a cool, dry place. 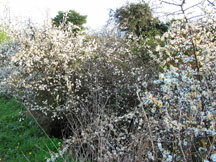 Blackthorn can be extracted quite easily if the fruit is ripe and soft. You need a bucket or two, a flat-bottomed pole (for example, an old sawn-off spade handle), a sieve or collander and access to a hosepipe or water supply. The berries are mashed and the waste and seed separated through the sieve. For a more complete description click here. The extracted seed should be mixed with equal parts horticultural sand or a sand/compost mixture (for these seeds the addition of compost to the mixture can help break dormancy). Use 50% leafmould or peat-free compost and 50% horticultural sand. For each handful of seeds add two or three handfuls of mixture. Select a pot that has enough room for this seed/sand mixture (and a bit more) and put a layer of stones in the bottom. Cover the stones with sand. Place the seed/sand mixture on top of this and cover this with 2-3cm sand. If these seeds are to grow the following spring, they will greatly benefit from a four week period of warmth. Each pot can be placed inside a plastic bag, which is tied loosely. This can then be placed somewhere warm (about 20 degrees celsius). Every few days, you will need to remove the pot and water it. The seeds must not dry out! Alternatively, the seeds can be placed directly into the bag, adding water each week. At the end of the four weeks, the seeds should be placed outside in the pots (after removing the bags!). Place them in a shady place and protect from birds and mice. If you don’t place the seeds in the warmth for a few weeks, it is unlikely that many of them will germinate in the following spring. They will remain dormant for another year. In which case, they should be left outside, in a shady place, until the second spring following collection. In early March check your seeds for signs of germination. If about 10% are showing signs of germination, they are ready to sow. In a 1-litre pot sow three seeds and cover with no more than 10mm of compost or grit. Firm gently and water. On a seedbed broadcast the seed quite densely – aim for about 5mm between seeds. Firm with a roller or board to press the seed well into the soil. Cover with 5-10mm of grit.